Lady Gaga sat down for an interview recently, mostly to give commentary about her latest album, but as the interviewer paused to check over her notes, Gaga (or shall we call her Lady?) started to stare dreamily into the air above her and said, "Oooh, look, a Blibbering Humdinger!" after which she quickly looked at the floor and mumbled something about having to go get her new meat dress smoked. Before another question could be asked, Gaga's bodyguard walked over and escorted the performer out the back door. The interviewer, while not unaccustomed to unusual antics from Lady Gaga, had this strange feeling that she had heard about Blibbering Humdingers somewhere before, and not in a Gaga song. For many days and sleepless nights her brain kept searching its deep recesses, trying to remember. Then one afternoon she hit on it—Luna Lovegood. After this interesting revelation, the interviewer decided to do some investigating. 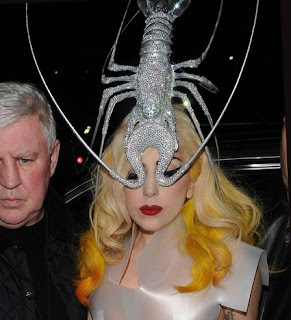 She hired a private eye to follow Gaga around for a week. 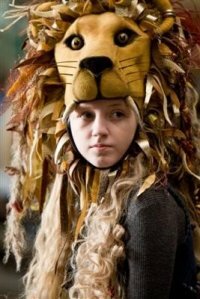 The question she hoped to answer and reveal to the world: Is Lady Gaga really Luna Lovegood? The private eye showed up to give his report at the end of a very harried week. Following Gaga around proved to be exhausting. There were the rehearsals, the TV show performances, and the late-night outings to outrageous clubs. He did manage to sneak some views of Gaga alone, playing her piano as she had back in her Tisch School of Arts days. And during this time, Gaga really let her hair down. No costumes, no masks, just a girl and a piano. Sitting in a tree outside Gaga's studio window, the investigator actually didn't have the best view for taking pictures. But what did it matter anyway? He still didn't have the proof of who Gaga really was, or had been. This news discouraged the interviewer as she realized her story of the decade would not come to fruition. She put away her notes, hoping that one day the truth would yet surface. Maybe Gaga would slip again, in public, let out another dreamy exclamation at just the right moment. "Show me your cards," the interviewer said aloud, while staring at two photographs. "I think you've been bluffing." My husband, a friend, and I took a hikeabout Friday morning in the foothills near home. Though excited to get out and have a good time, I had visions of the weary travelers along the Oregon Trail and wished instead for mountain forests and waterfalls to walk beside. Nevertheless, the day promised to be cooler than the heat wave of the first two days of summer, so we filled up our water bags, smeared on the sunscreen, and left. We met our friend where the road taken turns to gravel and then carpooled with him up the rough remainder until we hit trail. Once on foot, I happily crossed the conveniently placed rocks over a creek between the low trees and realized that we weren't going to hike only in dirt and sagebrush. The fact is that this particular location is not only lush (I use that term loosely) but also full of birds. We were scouting for birds—a favorite pastime of our friend. At first the birds eluded us. Their intermittent songs came from the trees and bushes, but they hid their bodies well. Then one would flit by, land, say a few words, and zip away again. Our friend, Amit, told us that many of the birds were Lazuli Buntings—small birds with bright blue heads and a touch of orange rust on their chests (Boise State colors of course, he laughed). As we hiked on into late morning, we started getting glimpses of blue. One of the birds even lit near us and sat, looking around a bit, but then got into an argument, or maybe something more playful, with another bunting and left before I could even think about taking a picture. Our hike continued along the sandy, narrow trail until we decided to sit among the grasses and watch and listen. Maybe the birds would come out if we were quiet and still. I looked up the hill and spotted two gophers standing on their hind legs and reminding me of the meerkat Timon. Surely they, motionless, would let me take a photo. I guess I got just a little too close. Sitting, waiting, camera beginning to dance around in my unsteady hands, I surrendered, took a snapshot of the naked hole, and left their place alone. What I imagined was two meerkat impersonators spying on me from another hole, laughing and pointing. Another creature, however—whether vain, oblivious, or bold—gave my camera what it wanted. Butterflies flew all around us during our climb and descent. Of course I had to keep snapping my mouth closed and pressing my lips tightly together whenever they flew too close—it's this bizarre phobia I have that a butterfly will fly into my mouth—but Luke captured some beautiful pictures. Now all we had to see was a snake. My husband has a few similarities to Indiana Jones: he's adventurous, clever, adamant that artifacts belong in museums, and hates snakes—okay I'm not certain about the museum part. Snakes don't exactly bring smiles and warm fuzzy feelings to me, but I have touched and held snakes and do find them cool to see in the wild. After our day's adventure, however, I will stop teasing Luke about them. Amit had said something about snakes and I had started filling him in on how much Luke detests them, when not long after we all came face to forked tongue with one. I confessed that had I been in front, as Luke was, I would have jumped a mile high too. But then Amit and I started taking pictures. This snake stayed still for a few minutes, flicking his tongue, and then with our movements toward him he started retracting his body into the bush. An invisible hand seemed to pull him straight back inside. He wasn't about to turn his head away from us. We politely walked on by, eyes more glued to the ground than ever as we expected another snake to appear. No more surprises or animal sightings greeted us for the rest of the hike. We took our hungry selves back to the city for food and began feeling the soreness in our legs and feet that would accompany us for a few days. That is to say Luke and I are sore; Amit probably isn't at all and that's good because his next hike will be in the Himalayas. I'll have to work up to that. My husband and I are sitting at a shall-remain-nameless coffee spot sipping our chilled drinks while he works through a Sudoku puzzle and I eavesdrop on a nearby conversation. It starts me to thinking—I know, that's surprising, when do I not think?—what makes such simple occasions so absolutely perfect? We don't have millions, a boat, or our own island. We don't fly to Paris for the weekend (jet lag would just not be worth it). We have plenty of clothes in our closet but I happily wear the same pair of jeans and the same sweatshirt day after day. We feel, and realize that we are, blessed beyond belief. Now my husband is strumming his guitar as the light fades and we relax on our back patio, reclining on our newly padded deck chairs. Earlier we took a walk by the river and admired the three baby swans who must be considered teenagers by now. I want to wrap this all up in the perfect words, but I don't have them. Lying awake thinking about cleaning out my refrigerator and doing a detailed inventory of the pantry doesn’t seem to make any sense but that is exactly what I was doing the other night. Oh how wonderful and at peace I will feel once I am done—such were my thoughts. And then on to my clothes closet. . . .
For me it quite often revolves around avoiding writing as if it were an appointment with a phlebotomist. See, I always get the nurse who really has trouble with my veins and doesn’t even seem to feel bad about how much I hurt—in both arms—after the abuse. I will do so many things except write. And I profess to love to write! Why would I rather clean something than write? I don’t claim to love cleaning. I like things, rooms, places, to be clean and I do get a great sense of accomplishment after cleaning, but the process isn’t always so enjoyable. Writing, however, is usually enjoyable once I start. The good news is that today I came home from work and my wonderful husband had cleaned up the kitchen! Wait, maybe that is the bad news because then I had no reason to not sit down at my computer and write. So let’s say the good news is that we have a clean kitchen (please ignore the dinner dishes) AND I am writing! Incidentally, I have this great idea that has been smoldering in my mind for some time now—this is how a lot of my writing comes about. I think it’s really quite close to appearing on a page, but right now I think I’ll go organize my office supplies. After a hot shower, my achy body soothed and my sinuses temporarily cleared, I drive to work, not willing to miss the last day of school. Sunshine never felt so wonderful as I walk out onto the playground to be a "duty" one more time. "You're here!" The exuberant call from the curly blond-headed seven-year-old girl comes at me just before the arms encircle my waist. "Watch me," she commands as usual and tugs at me until I follow her to the monkey bars. I watch her swing along on the rings and climb up onto a bar and then tell her that I am going to wander about and watch other kids too. Suddenly a third-grade boy rushes over and gives me a huge hug, catching me off-guard as this is not something he has done before. "It's the last day of school!" he yells, and goes running. I guess it isn't his excitement that I am back after being sick at home. Then my blond shadow takes possession of me again, chattering nonstop as we travel across the playground. "Mrs. H." A third-grade girl comes by and gives me a swift hug before going to play with a friend. Bump. Batty's brother intentionally rams into me as he walks by, no words exchanged. It's kinda his way of saying "see ya." Then my fourth-grade buddy hugs me and doesn't let go for a bit–she's sad that school is over. The bell rings and I turn in my radio and walk to the 2nd grade entrance. On the way, a second-grader comes up to do our special secret handshake. If only all this love from the children could really make me feel better. During the next hour I help the teacher with tasks around the classroom while she gets the kids packed up and ready to go and then reads them some stories. I can feel my illness trying to take over again, and I'm glad that school gets out early. Finally I'm back in the sunshine watching kids while they wait for their rides. I'm feeling rather warm now in my sweatshirt. I talk to a couple of kids here and there but mostly just stand around waiting for the last car to arrive. Then I get one more hug, this time from an ornery little girl who spent most of the year calling me by someone else's name and getting into more trouble than a bunch of boys. Yeah, I'll miss her too. It's time to go home and crawl back into my nest and continue to work on getting completely well. I'm curious to know what next school year will bring and where I will be.